Recently hired Wake County Manager David Ellis revealed his first budget proposal to county commissioners on Wednesday with increases in many areas of county government including an additional $30 million for the Wake County Public School System. 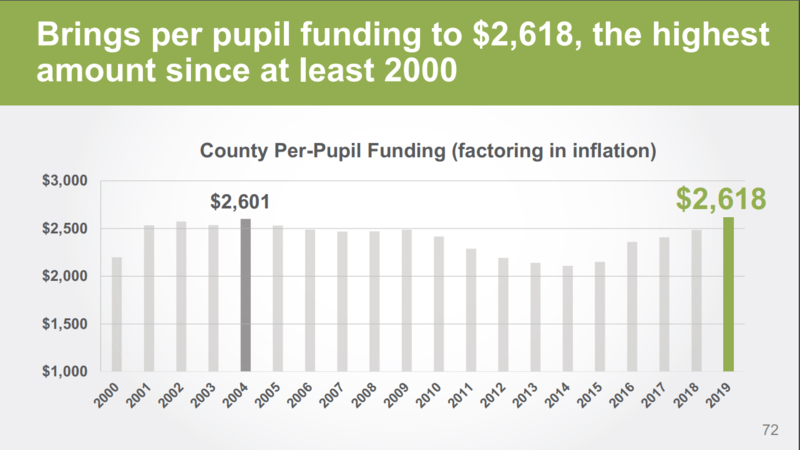 The increase in school spending represents the highest per-pupil expenditure in Wake County history, when adjusted for inflation, according to the manager’s presentation. The $2,618 spending per pupil, which appears to factor in both WCPSS and charter students, surpasses a previous inflation-adjusted high of $2,601 in 2004. The $30 million increase in local spending is the second largest one-year boost in WCPSS history, with the highest coming in at $48.3 million in 2015-16. It is also $9 million more than last year’s increase. However, it is a little more than half of what the school system requested from county government this year and well below the $48 million school leaders say is needed to maintain the current level of service to children in our community. 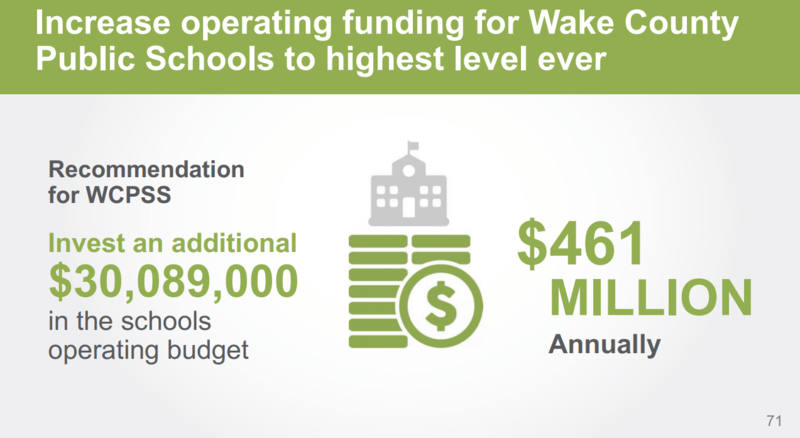 When the Wake County School Board approved its budget on May 1, it requested an additional $58.9 million. At the time the budget was presented to the school board, almost $11 million was needed for new programs like hiring more counselors, social workers, and psychologists, and adding more teachers for the academically and intellectually gifted programs. Baked into the $48 million minimum request is an additional $5 million pass-through cost for charter schools, the opening of four new schools next year, and the increased local cost for hiring more teachers to reduce class sizes in kindergarten through third grade as mandated by a recent change to state law. Another $8 million is being used to pay for special education services which were previously paid for with federal funds. In recent years, the difference between the two budgets has been a concern for the school board and the county commissioners. Discussions between the two boards became acrimonious last year, and both boards have attempted for most of the past year to repair their collaborative relationship. The two boards have held two joint meetings in the past seven months and plan another one on Tuesday, May 22. The commissioners will have two public work sessions on May 14 and May 30, and a public hearing for area residents to share their thoughts on the budget well be held May 21 at 2 p.m. and 7 p.m. The final vote on the budget will be Monday, June 4.